One of the newer additions to the Grohmann line of outdoor knives is the Grohmann Deer & Moose Knife. 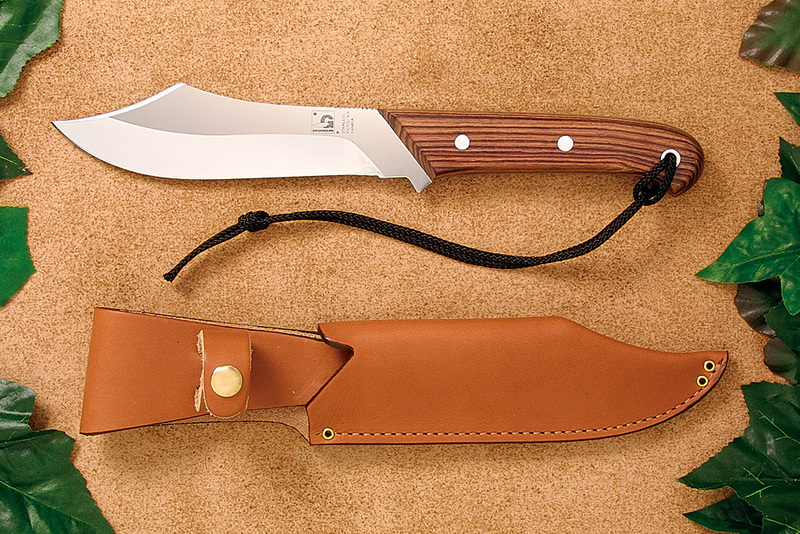 The deer and moose is a big, solid knife and sheath for all of your big game skinning. Particularly suited for those who like a more weighted blade and large handle. A favorite among big game hunters already, belt loop positioned high enough for comfort while sitting or riding. Blade approx. 5 1/2" x 1 3/8", of 3/16" stock, total length of 10 5/16" of high carbon stainless steel only. Various handle materials are available. "Dear Grohmann, I just wanted to send along a thank you for my new Deer and Moose knife (#R108s) that I picked up through Marshman Brothers. This is one really good looking, solid knife! I like this design and the materials, workmanship and "feel" are truly outstanding. This is my first Grohmann knife and I am very pleased. I hope more folks get a chance to take a look at this one because I personally feel you get a lot of knife for your money. Again, thanks, S.K. TN p.s. Hope this one makes it to the knife publications as I can't help but feel there might be some interest among sportsmen and maybe even the outdoor/survival types! "